Are you looking for wire cup brushes? 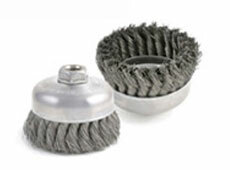 Brush research manufactures high quality wire and abrasive cup brushes for cleaning and edge blending. Contact a distributor today. 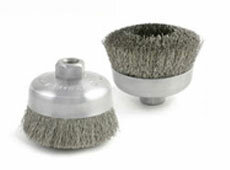 Cup brushes are most commonly used for deburring and surface finishing, as well as the removal of rust, paint or scale. 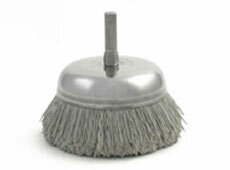 Brush Research Manufacturing produces cup brushes in a variety of sizes and abrasive types. 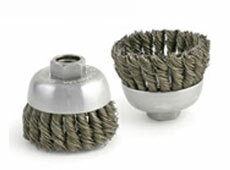 Our wire cup brushes are best suited for deburring and surface preparation of large surfaces. 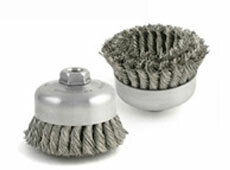 Our abrasive cup brushes are perfect for light deburring, edge blending and general surface finishing. 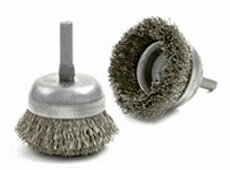 Contact a distributor to learn more about the various applications of cup brushes today. Abrasive nylon is excellent for light deburring, edge blending and general surface finishing. Abrasive nylon cup brushes are safe, non-reactive and offer an excellent alternative to traditional steel filament brushes. 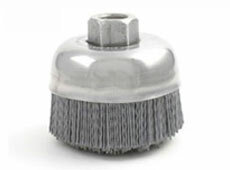 These abrasive brushes are ideal for both hand operations and for use in automated and CNC equipment. Please consult the abrasive filament chart for other grits and abrasive types.